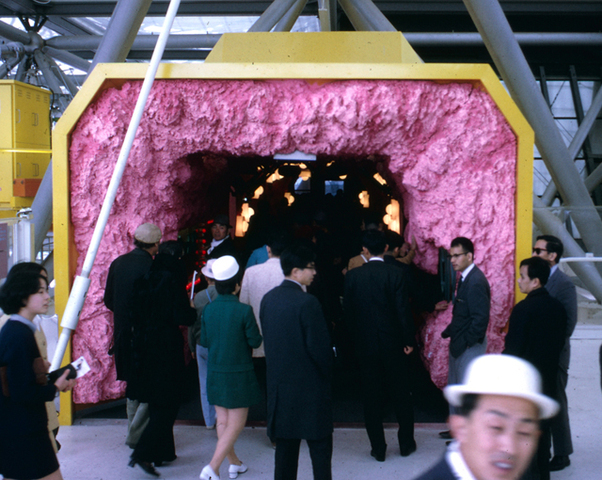 As Expo Milano 2015 continues to wow millions of visitors with stunning architecture and innovative exhibitions about the future of food production, we can’t help but get a little nostalgic for some past Expos. 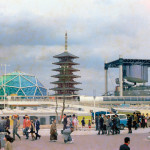 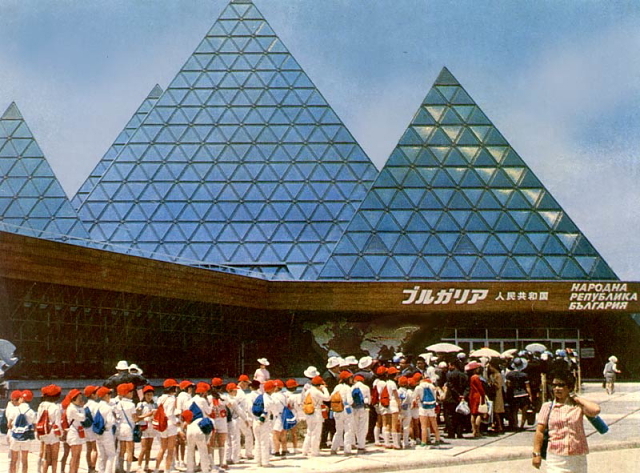 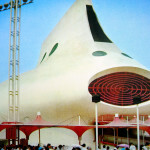 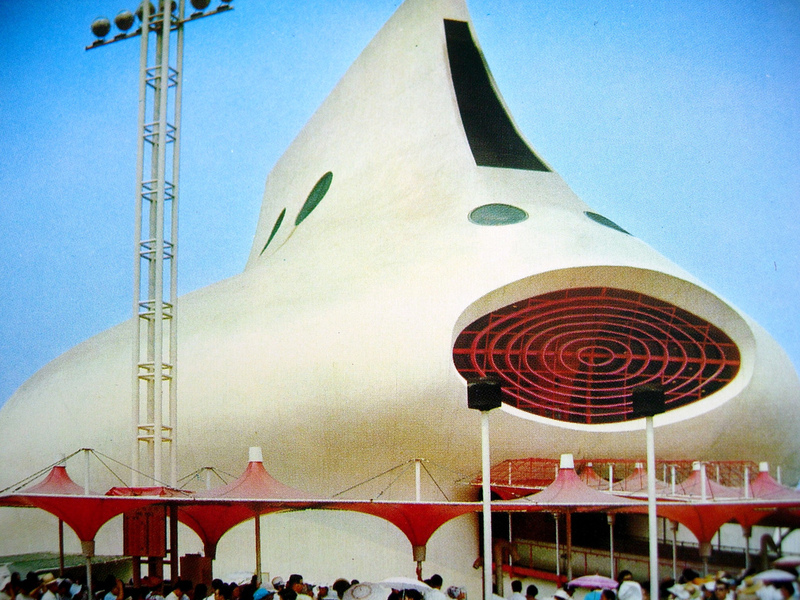 While London 1851 (Crystal Palace) and New York 1939 (The World of Tomorrow) are close to our hearts, it is the 1970 Expo in Osaka that really gets us fired up. 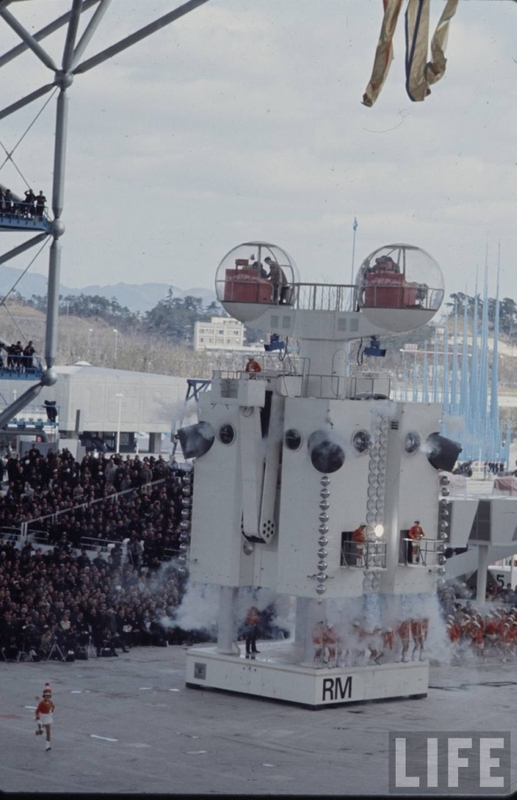 Take a look at the seemingly endless stream of fantastic designs after the jump. 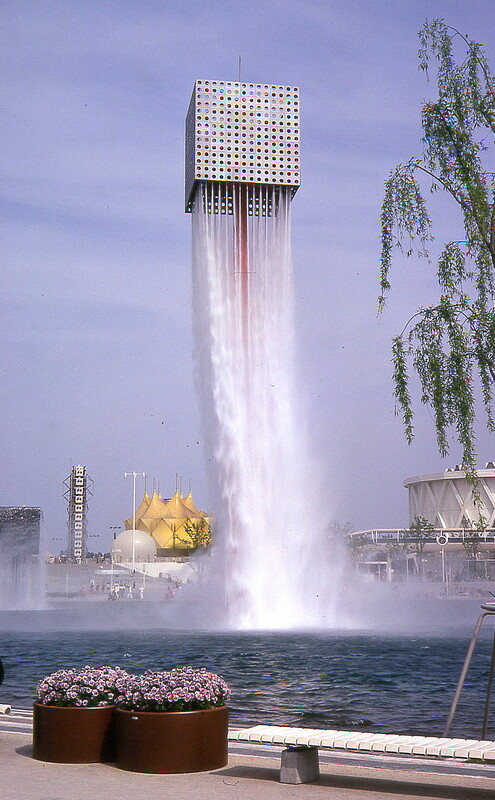 The result was one of the most explosive displays of architectural invention ever. 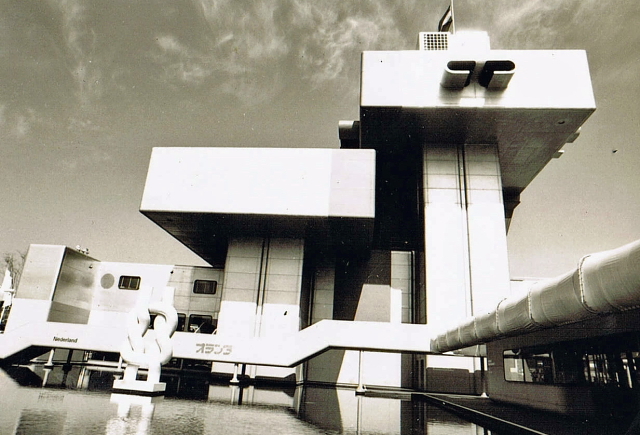 It was master planned by two of the masters of the Metabolist movement in Japan, Kenzo Tange and Uzo Nishiyama. 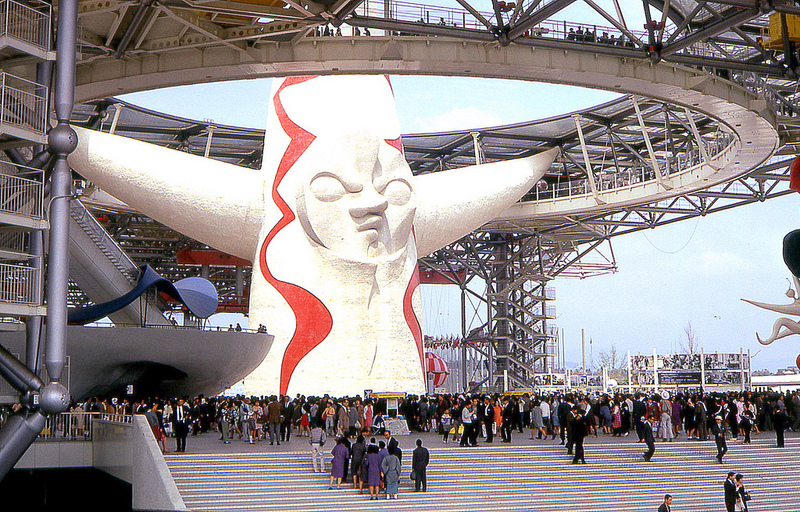 The pair represented two waves of Japanese postwar design, as Tange was a technocrat, and Nishiyama was a Marxist, more socially-driven in his ambitions to fight for the lower classes. 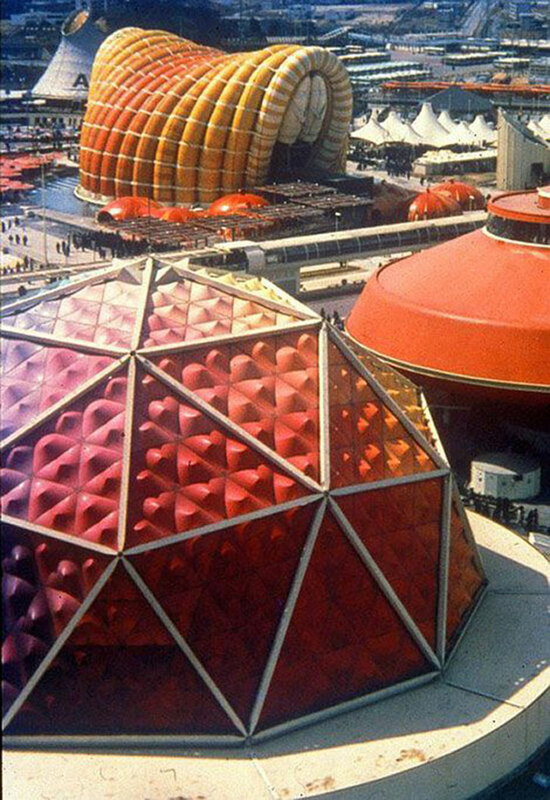 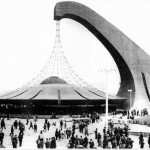 The Metabolists saw the fair as the realization of the urban ideas that they had been developing in the 1950s and 1960s. 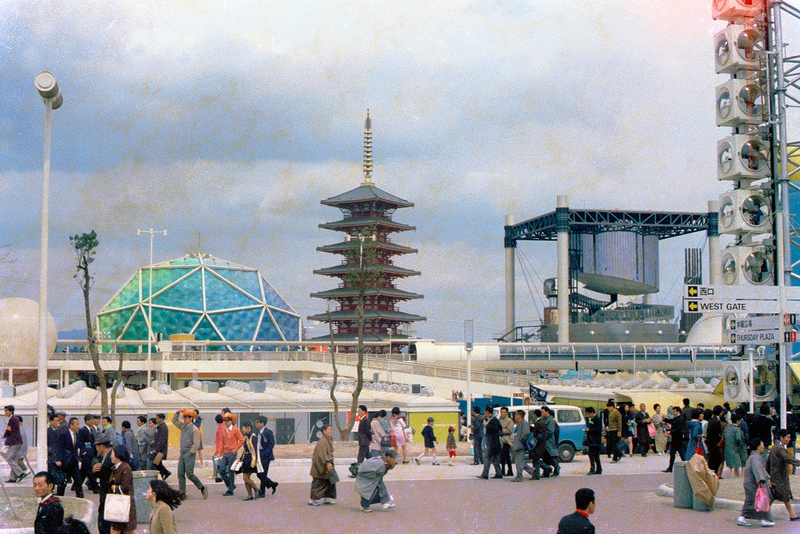 The grounds were conceived as a living, changing organism with a central “spine that could serve as the center of a future city.” For more on the plan of the site, visit Kenzo Tange and the Metabolist Movement: Urban Utopias of Modern Japan by Zhongjie Li. 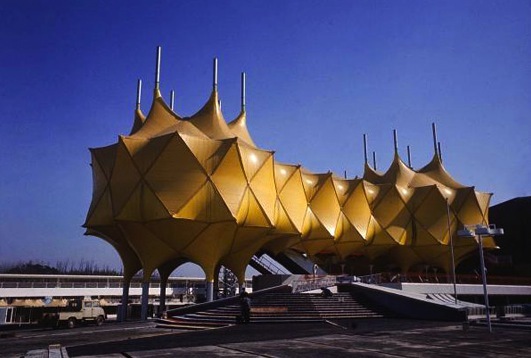 The pavilions came from 76 countries, one colony (Hong Kong), three US states, and one German city. 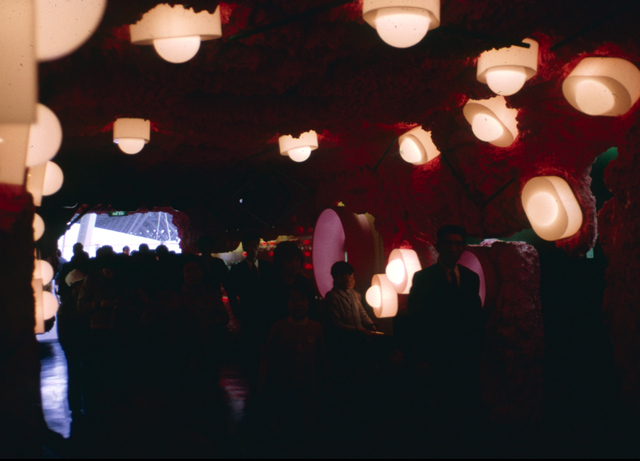 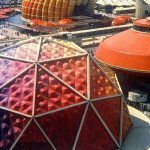 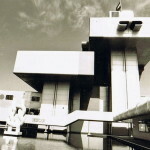 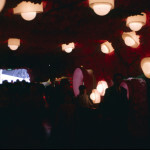 The pavilions were a mélange of the incredible experiments that were taking place in the 1960s. Space frames, prefabrication, technological integration, tensile structures, domes, inflatables, metabolism, and space travel were some of the themes shined through, and set a very high bar for future Expos. 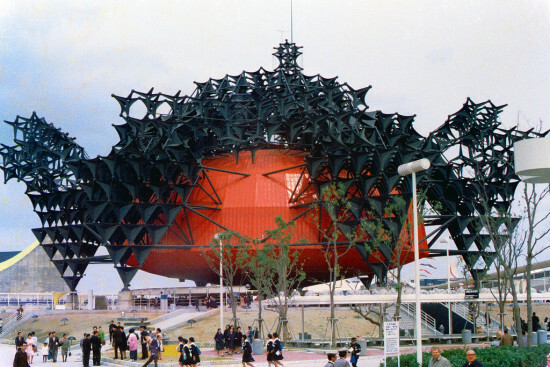 Of course, not everyone shares Archigram’s embrace of pop culture and fantastic architecture. 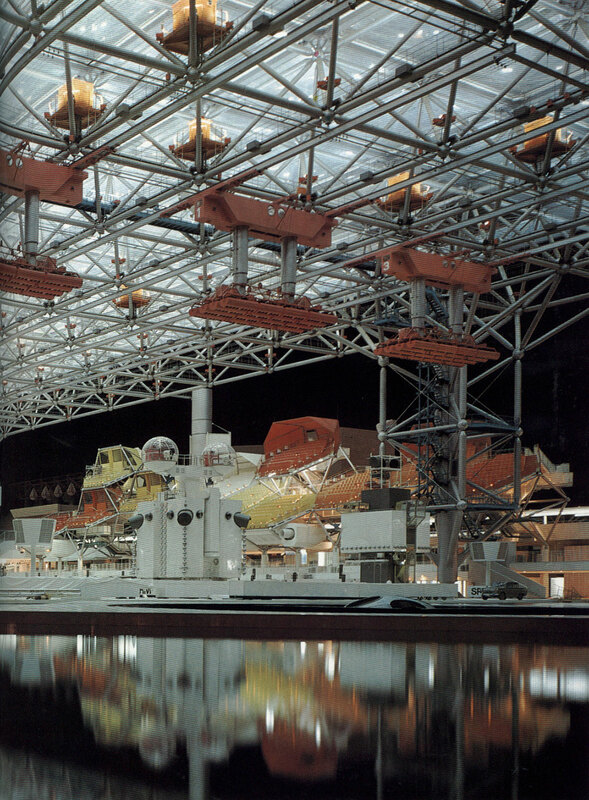 Many critics called it an amateurish, over the top celebration of national one-upmanship and consumerism that sacrificed many of architecture’s ideals, succumbing to politics and industry, which used the image of bombastic design to seem progressive. 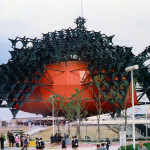 The main festival venue, designed by Tange, was an enormous space frame that could house performances, and each country got time for their own traditions and performances, such as Thailand’s 16-day Elephant Festival. 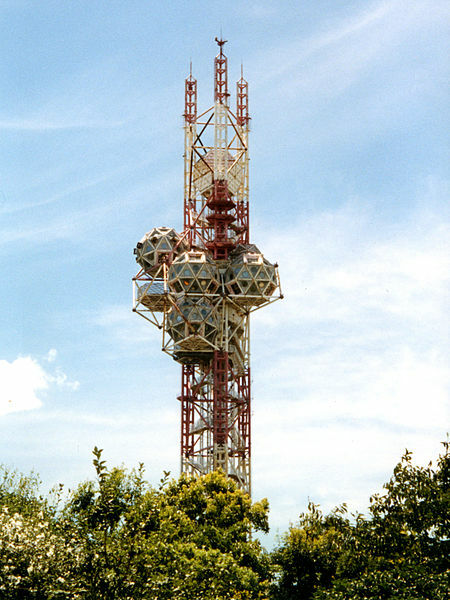 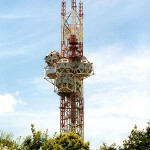 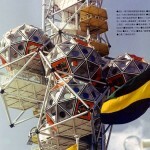 Kiyonori Kikutake designed the Festival Tower, which took on a high-tech aesthetic and loomed above the site. 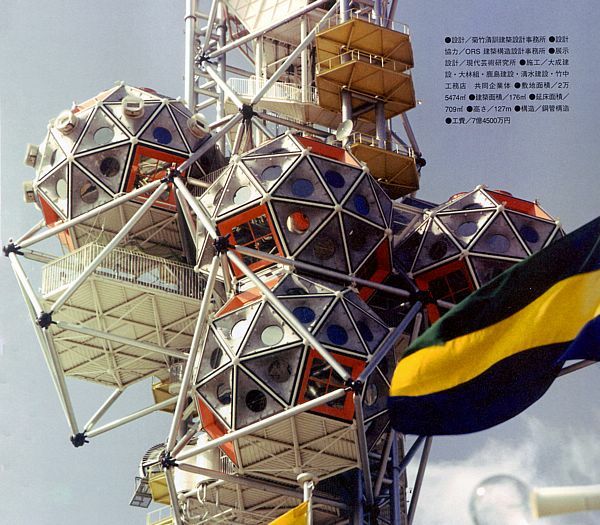 Kisho Kurokawa (of Capsule Tower fame) designed one of the three capsule houses suspended over the Festival Plaza. 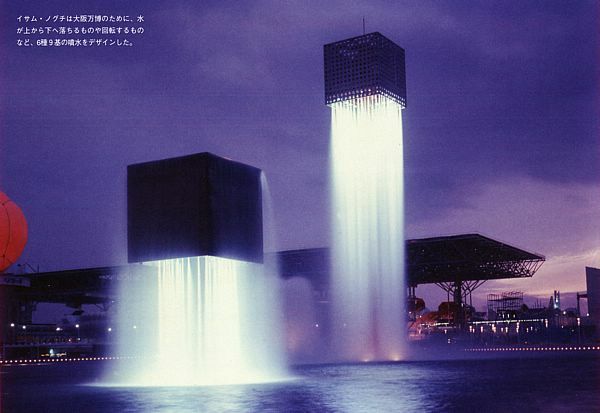 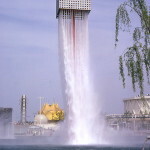 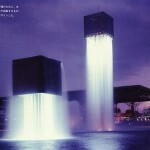 An enormous fountain designed by Isamu Noguchi rained water down. 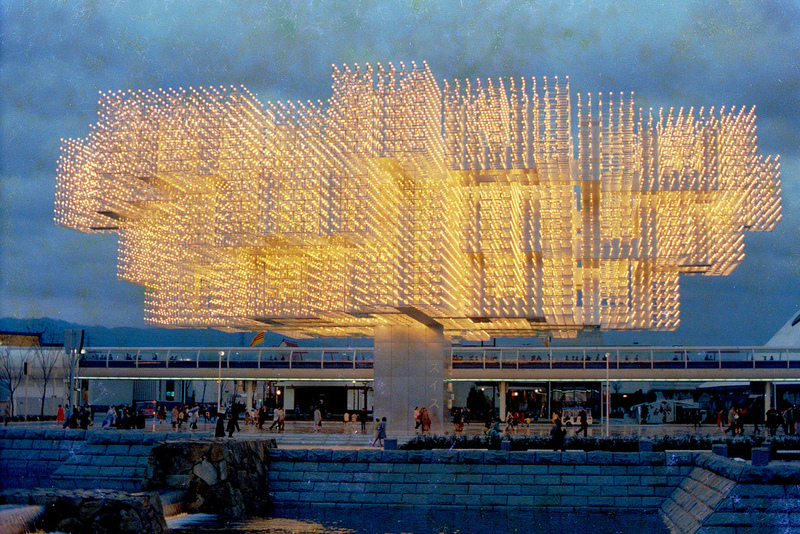 The National Pavilions took on a myriad of wild and technologically advanced forms. 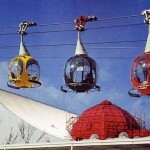 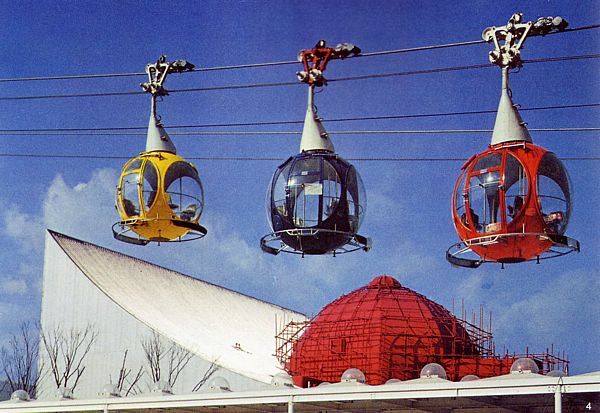 Transportation options included gondolas, a free perimeter monorail, and roller coasters. 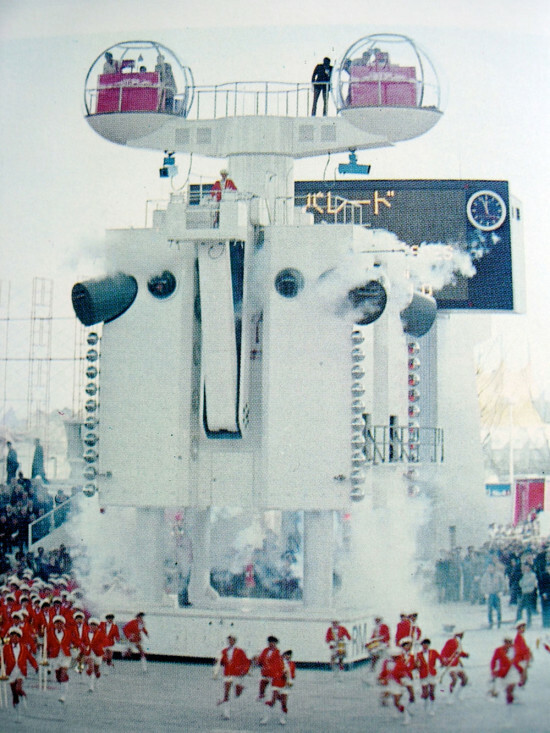 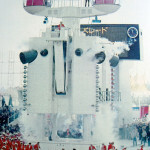 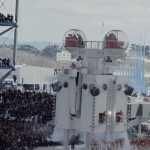 One of the more unusual parts of the Expo was Arata Isozaki’s “Demonstration Robot,” an enormous “robot” that featured a control booth in its head, arms that moved, and legs that raised it 24 feet off the ground, creating a stage in its base. 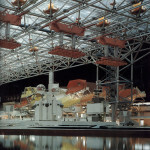 Not surprisingly, Archigram had an installation in the show. 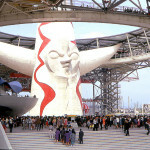 Produced alongside their friend Kurokawa. 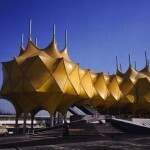 They shared an affinity for organic shapes and clip-on elements that could expand and re-configure structures easily. Kurokawa collaborated with Archigram on their exhibition as part of the Japanese Pavilion. 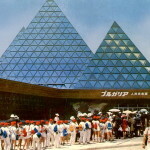 It include a dimly lit space with a “Futures Peepshow” and a “yes-no” button for audience participation. 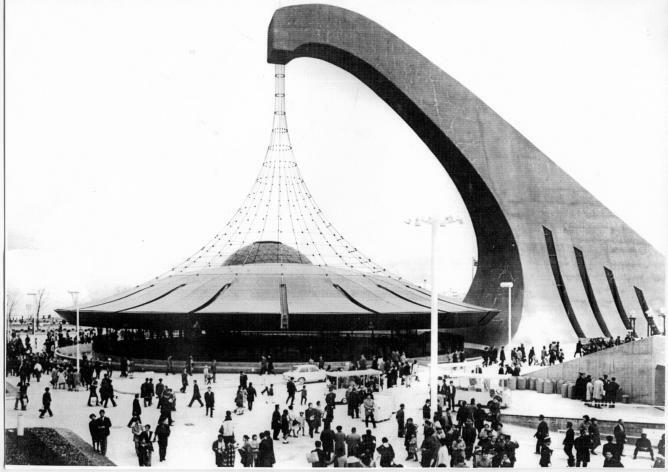 This is certainly true for one of the Expo’s more prescient projects, the Pepsi Pavilion, designed by the art collective Experiments in Art and Technology (E.A.T.). 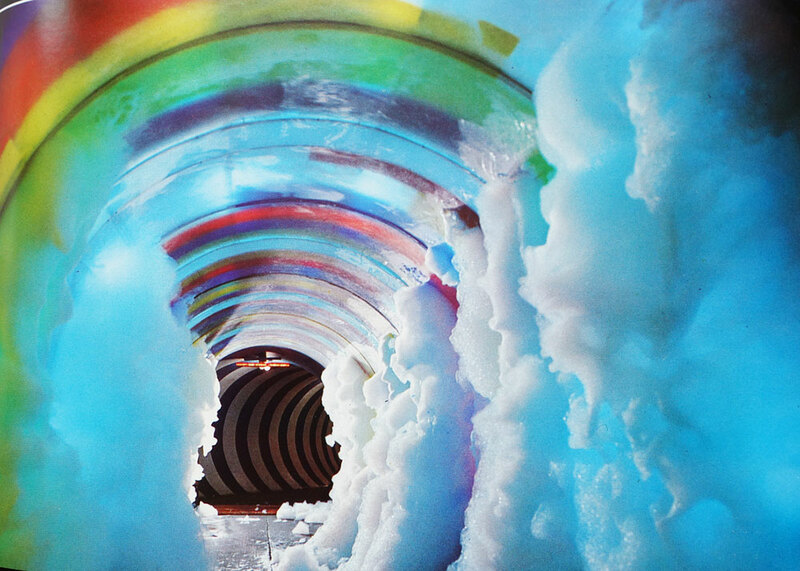 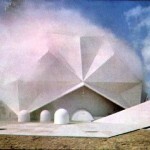 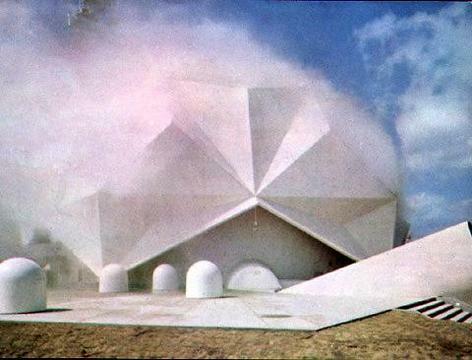 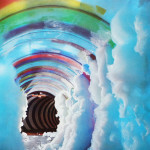 The building was a dome that immersed visitors in projected images, while the exterior featured a cloud-like water vapor sculpture that enveloped the faceted exterior of the dome. 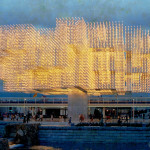 It was Diller Scofidio and Renfro’s Blur Building 30 years earlier. 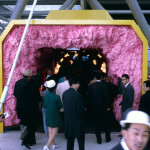 For more, visit Kaput Magazine, Pink Tentacle, or Flavorwire.